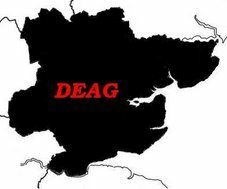 Thursday 18 September and another meeting of the DEAG arrives, where has the year gone? David E brought along Framsden, his entry for the Golden Jubilee Challenge (GJC), on which much progress has been made. The first picture shows the overall layout and I think it is striking how well the back scene and the scenics on the baseboard blend together. David's artistic skills certainly show well I think you will agree. The second photo is a close up of the right hand end of the layout showing some of the scenic details. Compare these with the photos of the layout in the February 2008 meeting posting and you will see that considerable progress has been made. Bill Blackburn is building a layout based on Long Melford and if you click on this LINK you can see how it looked in October 2007. In the background behind the railway bridge is a road bridge which at that time was a cardboard representation of what was to come. Bill brought along the partly constructed bridge which will eventually replace that. It is modelled from plastic card and at present is mounted on a rigid baseboard to stop it warping. The parapet was punched out using two separate passes, the punches set at right angles to each other. The lower former being simply two strips of brass set parallel to each other. The top and bottom rails have had grooves cut in them to accept the punched section to make a strong parapet. Progress on Marks Quay, also an entry for the GJC, has been slow but never the less it is starting to take shape and I will post an update soon. Our next meeting will be the 30 October, so plenty of time to get some modelling done! It's good to see so much happening down yonder. David's little layout is shaping up rather nicely; his artistic approach is a lesson for us all. I've only seen the first board of Bill's layout (at last year's AGM), but already it is an inspiration; just look at that bridge! Even in its unpainted form it looks so convincing, so real. Brilliant!